"This delicious and festive holiday drink is perfect for parties!" Combine the peppermint patties, milk, and vanilla extract in a slow cooker set to LOW. Cook 2 hours. Transfer the mixture to a blender and blend until frothy. 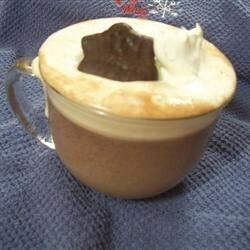 Pour into 6 mugs; top each with 1 tablespoon of whipped topping. See how to make creamy, old-fashioned hot chocolate.